We’ve seen a significant influx of new puppies in our Puppy Preschool program recently. Each month the class size is growing and it is exciting to see! 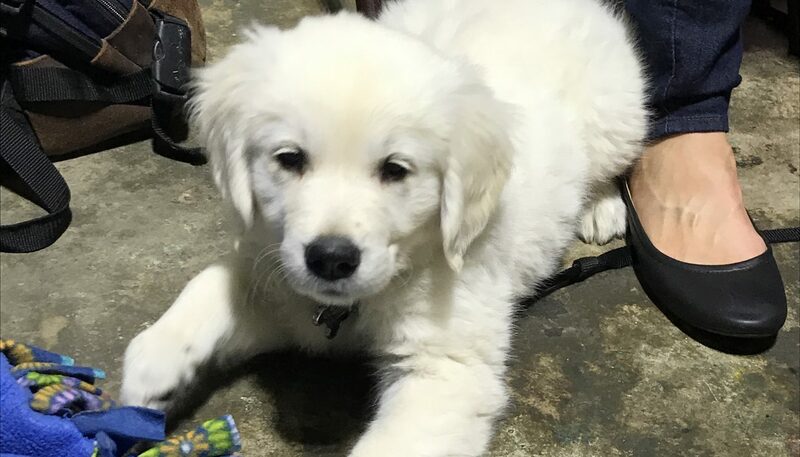 Not only is it fun to work with the young ones, but it’s highly rewarding to help owners start early in the effort to raise a well adjusted dog. Early experiences influence a puppy’s confidence and overall adaptability. By providing a pup opportunities to explore and problem solve, we build tolerance for handling stress. Having the ability to adapt is a good quality to build a long term relationship on. I’m reminded of this on a weekly basis when pet owners inquire about teaching their adult dog skills like jumping in and out of the car or standing quietly for brushing and nail trimming. Too often dog owners have, unintentionally, stifled their puppy’s development by immediately bailing them out of challenging situations. For example; a pup that is hesitant to walk down steps gets picked up and carried, or the puppy that protests when put in a crate gets brought into bed and allowed to sleep with someone each night. A puppy that “doesn’t like” being brushed ends up matted and getting shaved down because he never learned how to tolerate the experience of being groomed. These are just a few examples of how we hinder development by not teaching our dogs how to tolerate stress or how to problem solve. As a result, they end up being more challenging dogs to live with because we have to work around issues. And having to work around issues for ten to fifteen years can wear our patience thin. Rather than having to go through a lot of work to overcome some of these irrational fears and hesitations as an adult dog, I encourage puppy owners to put in the work early. Here are three things you can do to help your pup grow into a more confident and emotionally stable dog. Teach the puppy to tolerate restraint. This will not be an exercise your dog “likes” right off the bat. But it is a skill that will serve them well for a lifetime. Our children have to learn to sit still for a haircut or learn to have their teeth brushed, our pups can learn similar skills. Just because a puppy squirms or protests when you brush him, trim nails or open the mouth, does not mean you should let him go immediately. In fact, you should patiently work through the resistance and release him when he is calm rather than wiggling. The ability to tolerate restraint means the dog will be easier to groom or go through a veterinary exam with limited stress and frustration. Allow your puppy time to problem solve. Put food, treats, or toys into places that are harder to reach, like under a blanket or in the back of a dark closet and encourage the puppy to get those things without you doing all the work for him. If the puppy loses a toy under the bed or sofa, allow him to retrieve it on his own if possible. Provide toys and play games that encourage problem solving so that you are expanding your dog’s mental stamina and alleviating boredom. Help your puppy learn body awareness and build confidence in his physical capabilities. Encourage your puppy to go up and down stairs, navigate over or under objects, walk on different surfaces, or jump on and off of items. Keep the challenges appropriate to the pup’s age and size, but do provide these experiences while they are young. By doing so your puppy can grow into a dog that is less reactive and able to handle stress of changing circumstances with greater ease. Encouraging your puppy to navigate physical challenges as he grows will also help good muscle development and coordination. Raising a puppy is a LOT of fun, but it is also a responsibility. Do yourself and your community a favor by taking time each day to help your pup develop into a dog that is balanced both physically and emotionally. The old saying; “there’s no time like the present” certainly applies to the idea of investing time and energy into your puppy’s training. Previous post: Here comes Autumn!